Looking for a new keyboard? Look no further! I wanted to upgrade my 8 year old keyboard for something that looked better, worked better and had some more modern functionality… Enter the Corsair Vengeance K70 keyboard. It took me a few days to decide on what keyboard to actually get, there are a lot of options out there, but after doing a lot of research, and penny pinching, I decided to just go for it and order the K70. The K70 is constructed really well, it has an all Aluminium body with clean lines and a great looking design. The USB cables are cloth wrapped, and yes, I said cables, there are two, one for connectivity the other for power for the lighting. The cables are all wrapped together so there is just one large cable with two USB connectors to plug into the computer. 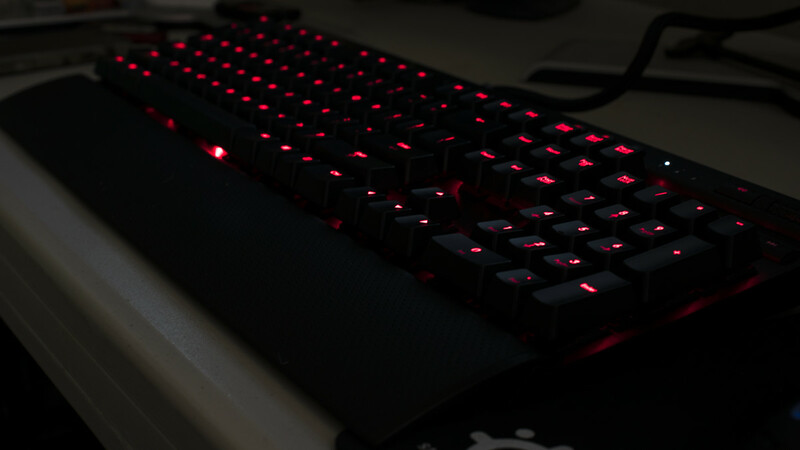 The control buttons on the keyboard, for adjusting the lighting brightness and to quick jump to only illuminating the “gaming” keys are nice, and have a nice soft feel to them. The lighting for the control keys, like caps lock, scroll lock and number lock is nice, and clean. The lighting for these is white opposed to the red of the key and other lighting. The Volume wheel is nice, works smoothly and is really a nice to have. It works very well, is textured for traction and a cool look. It spins smoothly, and I’ve found that I use it more frequently than I ever thought I would. The K70 also includes a wrist rest, something I didn’t think I cared much about. My last keyboard didn’t have one, but now that I’ve been using it with the rest, I like it. It’s a nice include. The rest is well made and has a nice “rubber” feeling… It does what a rest should do, more or less. If you have real wrist problems you probably have a special rest, and you can use it instead of the included one, it just snaps on and off. 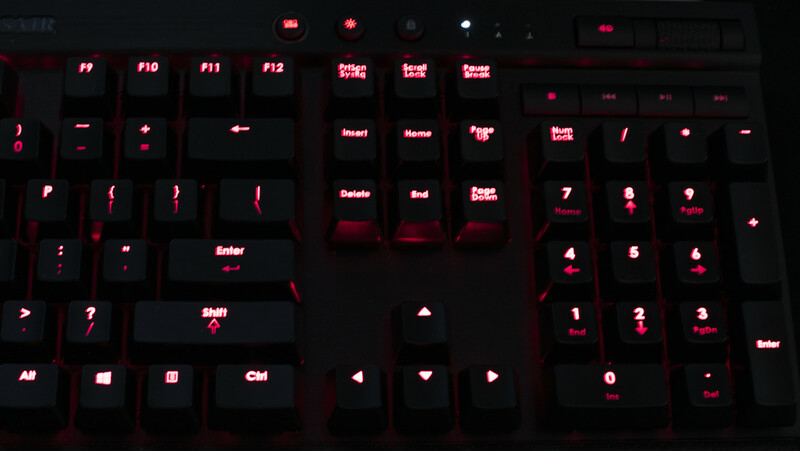 The lighting on this keyboard is red. It looks good and has 4 brightness settings, low, medium, high, and off. The only issue with the lighting that I have is that it’s not really uniform lighting. The LED is obviously in the top of the key, so keys with writing on both the top and bottom, like all of the number keys, look faded on the bottom number, and are much brighter on the top of they keys. This is just a little nit-picky thing, but it would be nice if the lighting was more uniform. Cherry MX key switches are nice… I’ve heard nothing but good things about them (other than maybe noise) from pretty much every source I’ve looked at. There are a lot of different types of Cherry MX switches, there are Blue, Brown, White, Red, just to name a few and they all have slightly different characteristics. You can find a really good reference to Cherry MX switches here, keyboardco.com. If you’ve never specifically used a keyboard with mechanical switches, they are quite click-clacky… i.e. they are loud. How loud are they, well, they are substantially louder than any of the non-mechanical keyboards out there. I personally like the noise and the feel of mechanical keyboards, it feels like using and old Point-of-Sale keyboard from the late 80s or 90s. But if you have to worry about keeping people up while you type that book report at 2am, I’d probably keep a good old cheep pressure switch keyboard on hand for that stuff. Bottom line, would I recommend this keyboard to someone or buy it again? Yep, without hesitation. It’s a great keyboard. It’s a little louder than I’m used to, but definitely not what I would call loud. The key travel also takes a little getting used to as there is more range of motion with the keys than non-mechanical keyboards. But it’s a great keyboard. If you are just doing some research, I just recently heard that Corsair and Cherry MX are working on a “Silent” switch keyboard. I have no idea what that means, but my guess is there will be some new products out in the coming months that offer another key switch option. Next Post:Nested Tag Builder: HTML Tags Easier?